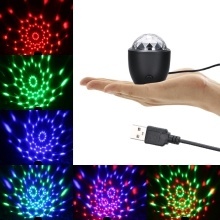 Sensitive sound-activated, dance to music together with it, just enjoy the joyful atmosphere. Flexible control modes, one is auto-running another is sound-activated mode. Colorful light color and gorgeous pattern heats the party atmosphere. USB powered, convenient design, practical to use. Mini size and light weight, it can be carried to anywhere you like and it takes up little space. Be suitable for home party decoration, bar, club, DJ show etc.